I’m not sure that Eddie Kunz is as ready for MLB as everyone would like, but he already has some “color”. See that photo to the left? That’s Eddie Kunz after finishing his warmup pitchers, right before taking the mound. He stood for about five or ten seconds, apparently in some kind of a zen pose or personal psyche-up session. It reminded me of an old-time closer known as “The Mad Hungarian”, Al Hrabosky, who used to talk himself into a frenzy before pounding his fist into his glove and taking the mound. The point of the routine was to either intimidate the batter or at least let him know that Hrabosky was out of his mind. Since this was the first time I saw Kunz in a game, I don’t know if this moment of meditation is something he does all the time. I hope it is … it would be nice to see a bit of character and individuality added to a game that has lost quite a bit over the last 25 years. Enough of the cookie-cutter ballplayers! 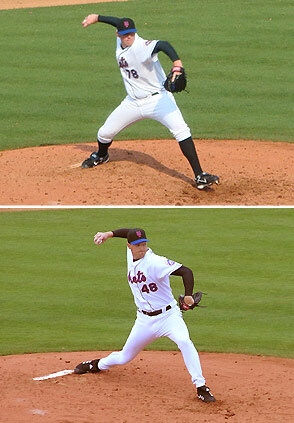 Another note on Kunz: his body type and pitching motion are both similar to Mets setup man Aaron Heilman. See the comparison below — Kunz is on top, Aaron’s on the bottom. See 50 megs of photos of Johan Santana in his 2008 spring training debut with the Mets. Most were shot in “burst mode” (a very cool feature, btw), so you can see his motion in sequence. You may have seen the game on SNY — or will watch the replay this evening, but I’ll give you my notes from the game as I saw from Tradition Field. Johan got knocked around, but there’s no reason to panic. His velocity was good, around 93-94 and maybe a few popping a bit more than that. However his location was not great, as he was getting too much of the plate and left a few right over the middle, including one crushed by Juan Gone. By the way, I still wouldn’t get too excited about Juan Gonzalez and his comeback attempt; I’m convinced it was a flat, floating changeup that he jumped on and put over the fence. Johan spent a lot of time warming up before the game; I’d guess he threw around 60-85 pitches all told between pregame, in-between innings, and the game. Aaron’s mechanics looked a bit off, which is nothing new. He was getting under the ball frequently (low elbow just prior to, and at, release) and as a result his fastball was up most of the time. Somehow he manages to stay on top of his changeup — maybe he concentrates more? — and he threw a few nasty ones, including one to whiff Albert Pujols. Billy the Kid wasn’t hitting triple digits, but I’d guess he was in the mid-90s on some of his offerings. His command was pretty good, keeping the ball at the knees and missing in the dirt. He was tinkering in the bullpen with a big overhand curve, which didn’t look so hot to me. It is too much of a change in velocity from his fastball; he slows down his windup and you can see it coming a mile away. Doesn’t help that it’s far from a “Lord Charles” – it’s a hanger. Unless it improves drastically in the next few weeks, let’s hope he shelves it. Figgy is a lean, wiry guy with an easygoing, loose motion. He has a 3/4 delivery, but he dropped down sidearm a few times in his bullpen session. He has a quick release to the plate, which should keep runners close. His stuff is OK — an average fastball with decent life that seemed to be around 90-91, and he mixes his speeds well. He fooled one hitter by throwing in the high-80s most of the at-bat, then reaching back and putting some extra mustard on strike three; my guess is he hit 93 on that pitch. It was a pleasant surprise to see Duaner, though he didn’t look comfortable. His warmup session in the bullpen was abbreviated and not too serious. I’d guess he threw about three-quarter speed for half his session, and less than half speed for the rest of his pregame. Once in the game, he didn’t appear to be ready to go, and his velocity was nowhere near the Duaner we know — probably in the high 80s — and Pujols jumped all over one of his fastballs like it was BP. Eventually Duaner settled in and probably got above 90 for a few pitches, and his ball had the good down and in “run” or movement that made him so successful in 2006. Despite the good movement, he was a bit up in the strike zone — he needs that ball to get more sink. He threw two downright nasty changeups in his one inning of work. This guy has a thick lower body, reminds me a bit of Armando Benitez in that sense — but sans the belly. He uses that thick base to propel the ball around 95-96 by my approximation, but keeps his fastball high in the zone with not much movement. His fastball reminds me of Mike Scott’s – before Scott learned how to deface the ball. Diaz also throws a really hard slider, one that breaks down sharply around 92-93, but had a hard time keeping it close enough to the strike zone to get swings and misses. If he learns how to throw a straight change, he could be a deadly force. Until then, he’s a AAAA guy. The little lefty threw lots of junk, stayed around the plate, then every once in a while popped a fastball around 90-91 that looked like 100 compared to his 83-86 MPH offerings. He left several pitches up, and he can’t afford to do that. He changes speed and location on every pitch. This is one big dude, a horse. He’s a sidearm slinger with a quick release, but doesn’t get as low as Joe Smith. He hummed with pretty good velocity, I’d say around 92-93, and his ball had good sinking and sideways movement. In many ways he reminds me of Aaron Heilman — body type, motion, arm angle. Unlike Heilman, he’s not herky-jerky and doesn’t have much deception — he might want to try to use his glove to hide the ball a little better. He kept the ball too high in the zone today; if he wants to make the team he’ll have to get his sinker down around the knees. Ramon Castro is looking fit and mobile. Not exactly catlike, but he did move well behind the plate today, blocking several pitches in the dirt. Fernando Martinez made a spectacular, diving catch in the ninth inning, but the eventual winning run tagged up from third and scored on the play. Ruben Gotay did something to silence those critical of his righthanded hitting — he took one over the leftfield wall from the right side in the bottom of the ninth to make it a one-run ballgame. The Cardinals had an impressive, tall lefty named Jaime Garcia who threw a lively fastball (93-95) and mixed in good breaking stuff. He’ll be seen again, I’m sure. In the third inning, a car model and license plate number was called out as the dirtiest in the parking lot; the owner won a free car wash.
By the way, I’m curious … if anyone watched the game on SNY, and they had radar readings, I’d love to know how close my guesstimates were to the actual MPH. Comment below, thanks. FYI, you can see Mets spring training photos here. Am heading out to Tradition Field now to get more photos and will be posting more pictures and captions later this afternoon … as well as notes regarding the game. It just wasn’t fair … the clean, unadulterated Mets had no chance against the juiced-up Cardinals, who appeared to be sponsored by Deca-Durobolin. OK, OK … it’s not right to suspect the Cardinals of using PEDs. Albert Pujols, after all, wasn’t named in the Mitchell Report as had been erroneously reported before the masterpiece was published. And I’m sure that Rick Ankiel, Troy Glaus, and Juan Gonzalez all did it “once” because of an injury and stopped immediately, realizing it was the worst mistake of their lives. Anyway, enough about them. This is about the Mets. Looked good in the first inning, not so good in the second. He got two quick outs and appeared to have a third on a strikeout of Glaus, but the umpire was intimidated by Troy’s bulging biceps, terrible breath, and apparent ‘roid rage. Maine was a bit flustered by the call, as well as a subsequent one, and finally allowed Glaus to single up the middle. From then on, Maine was a mess, looking completely uncomfortable working from the stretch. He was working from the 1B side of the rubber, opening up a hair too early, falling over a bit too much toward first, and therefore leaving his pitches up and in (to RH). From the windup he didn’t seem to have these issues, and was throwing both a good fastball and a nasty changeup. The Show came on to throw one pitch to get Maine out of any more damage and end the second inning, then threw a scoreless third with mediocre fastballs and sloppy changeups. His velocity was somewhere in the mid-80s by my eyes. I thought for a moment I was watching Kenny Rogers. Juan looked very loose, relaxed, and comfortable on the mound. His velocity was so-so, in the mid 80s, perhaps hitting around 87-88 here and there, with good sinking movement. His location was where it needs to be – down in the zone – and he kept his pitches over the plate. The New York boy didn’t look so hot. His velocity was probably touching the mid 90s, but he was wild high and his arm was under the ball — looked like he was pushing it at times. He walked two and gave up a few Texas Leaguers and a few hard liners; not a good day. However, he did throw one nasty off-speed breaking pitch to strike out Glaus, who was faked out of his biceps. Not a good day for Joe. He was wild, off the plate, and when he was around the plate, his pitches were up and flat and were getting hit. This kid was somewhat impressive. His stuff was decent, and he looked very sharp: on the plate and low in the zone. Velocity looked to be in the 92-93 range, and he was working in what looked like a slider. He was pitching like it was midseason to batters hitting like it was the first week of spring training; still, he’s clearly trying to make an impression and win a spot. This AAAA pickup threw high, straight fastballs around 88-90. That’s called “BP” in the bigs. There wasn’t much to say about the hitting, so I’ll just offer my random notes. – Fernando Martinez started in centerfield and batted second. There’s no question he’s an athlete, and his body is starting to fill out. He’s much faster than I thought, and has a strong arm; he threw one ball from the warning track to the edge of the infield dirt on a line. The kid takes a big, hard cut at the ball that causes him to spin around on occasion — reminds me of Reggie Jackson in a way. – Carlos Delgado looks trim, in good shape, and very happy. He was smiling and cracking jokes the entire game, and spent considerable time talking to the young pitchers and trying to keep them calm. – Jose Reyes did some smiling, but more concentrating. He and David Wright were FOCUSED and playing like it was a regular season contest. – After Brian Schneider left the game I thought Ramon Castro was catching, but it was Robinson Cancel. That man is THICK. Poor kid has no neck, but he certainly hustles. – I wouldn’t waste a fantasy pick on Juan Gonzalez. He’s in fantastic shape, is clean shaven, but lost his bat speed. That big, long, loopy swing is OK when you’re 25 years old and juiced up on PEDs, but hard to get away with when you’re age 38 and deflated. Unfortunately not much else to report. However, I’ll be at Port St. Lucie on Friday morning and hope to have good reports on Johan and possibly Duaner Sanchez. By the way, game photos are here. Word down here in Jupiter is that the Cardinals have released Scott Spiezio, based on his the outstanding warrant for his arrest in California. OK, we won’t get on LaRussa for his DUI charge last spring. Nor will we point out the unfortunate death of Josh Hancock due to a drunk-driving acccident. Never mind Rick Ankiel and his HGH deliveries. The St. Louis Cardinals are not going to associate themselves with people who break the law! Believe me, I’m not losing any sleep over Spiezio’s dismissal, and I won’t miss that stupid-looking large-mouth bass lure hanging from his bottom lip. But you have to wonder — what if it was Chris Carpenter or Albert Pujols in this situation? Would the Cardinals take the same hard line? I do understand this is Spiezio’s “second strike” — he was put into a substance-abuse program during the season last year — but is he being released solely because of his legal issues or because of his baggage and the fact he’s a fringe player at this point in his career? Methinks if Spiezio was a 24-year-old lefty who threw 95 MPH, he’d still be in the organization — getting third, fourth, and fifth strikes if necessary. OK, I realize most of you are much colder than me … I hear it’s in the teens with snow in some places. Sorry ’bout that. But it isn’t exactly balmy down here … 46 degrees and windy as I type this. Good thing my suitcase is packed with nothing but shorts, t-shirts, and open-toe sandals! Anyway, the plan today is to head over to Jupiter and watch the Mets play the Cardinals at 1pm. 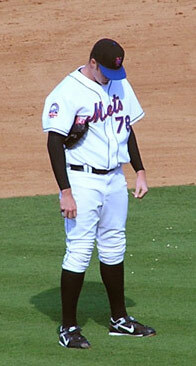 From what I understand John Maine will be starting for the Mets. I’m on my way down to Port St. Lucie this afternoon to get an eyewitness report on the status of the New York Mets. While I’d love to say this is an “official” trip specifically for MetsToday, it’s really an early birthday gift from my wife. But, assuming Florida’s power grid turns back on and I can get an internet connection, I will be posting notes and photos from spring training as often as possible. Yes, part of the itinerary includes seeing Johan in his “debut” as a Met on Friday afternoon. If there is anyone or anything in particular you want me to check out, leave a comment and I’ll do my best. And if by chance you are in the area, drop me an email so we can meet for a hot dog at Tradition Field.